Yep, that’s me trying to get Love Shack by the B52s in your head because its in mine. Why is this on rotation in my head, you might ask? Because I’m writing about Moon Dog Love Tap Double Lager. Perhaps is a bit of a stretch but that’s where my brain went! I have enjoyed the wonderfully fun names Moon Dog give their beers, from “Freaks and Geeks”, “Magnificent Mullets – Melon Gibson” and “Billy Ray Citrus” and “Perverse Sexual Amalgam”. They grab your attention because you know they are going to be something different. The accompanying images are equally fun, after all who can resist a pig with a top hat and bow tie? Love a well dressed hog. 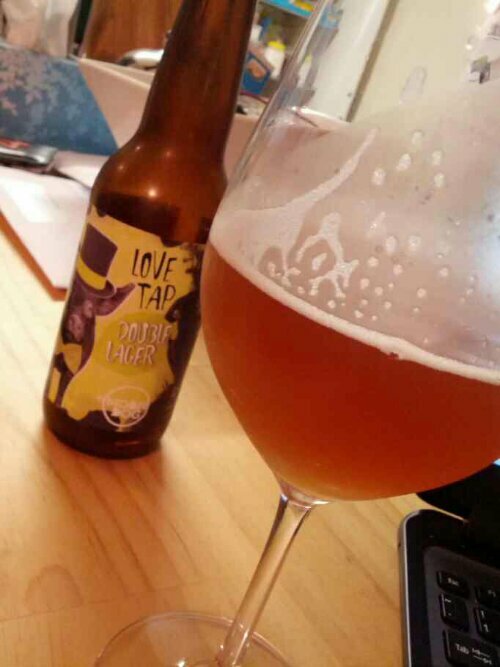 It’s great to get into some fine tasting lagers and Moon Dog Love Tap certainly falls into that category. It is a lovely hazy copper colour and smells like flowers, dried apricots and lemons. The floral characters continued on my palate with rich spices, sweet malt and tropical fruits. … love rules at the love shack!